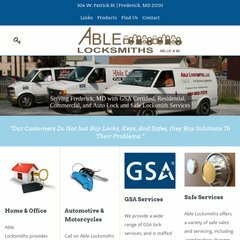 www.Ablelocksmithsllc.com - Able Locksmiths LLC. Topics: Gsa/dod Services, and Transponder Keys. American Registry For Internet Numbers (Virginia, Chantilly) is the location of the Microsoft-IIS/7 server. Its 2 nameservers are ns54.domaincontrol.com, and ns53.domaincontrol.com. ASP.NET is its coding language environment. PING (97.74.215.156) 56(84) bytes of data.